BCBS has published the following two books. Both are available to purchase from our on-site bookstore and major online retailers. Early Buddhist Meditation Studies (Volume 1) by Bhikkhu Anālayo. 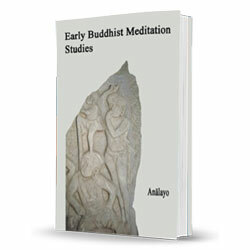 In this book, Bhikkhu Analayo, scholar and meditation teacher, examines central aspects of Buddhist meditation as reflected in the early discourses of the Buddha, based on revised and reorganized material from previously published articles. The main topics he takes up are mindfulness, the path to awakening, absorption, and the brahmaviharas. He compares parallel versions of the discourses in a variety of languages which offers a window on the earliest stages in the development of these Buddhist teachings. Available from Amazon, Barnes & Noble, and IndieBound. 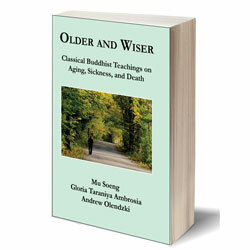 Older and Wiser: Classical Buddhist Teachings on Aging, Sickness, and Death by Mu Soeng, Gloria Taraniya Ambrosia, and Andrew Olendzki. This book is offered as a support for all of us dealing with one very real question: How do we continue seeking and finding happiness, inner tranquility, and wisdom in our elder years? Through both scholarly examination and thoughtful reflection, these selected discourses guide us in how to apply the teachings of the Buddha to our daily life and practice. Embodying the teachings in this way, we find that even in our elder years it is still very much possible to find ease and joy, even while dealing with the inevitabilities of aging, sickness, and death. The three teachers—a Theravada scholar well-versed in the early teachings of Buddhism; a Zen scholar and practitioner from the Korean Zen tradition; and a lay Buddhist minister and Dhamma teacher rooted in the Thai Forest Tradition—offer a range of perspectives speaking to a wide range of interests, points of view, and levels of experience with meditation and Buddhism. A collection of reflections is additionally offered, which can be used both for private contemplation or to support discussions among friends or communities. Available from Amazon, Barnes & Noble, and IndieBound.